At some time or other most of us wonder how we can pass our research on to others. What better way of doing it than creating a book. 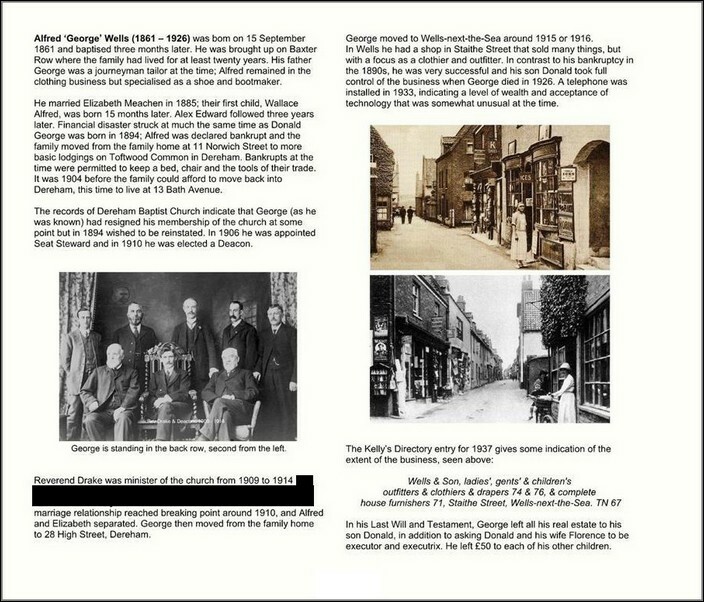 Wulliam, one of our members, has created a book using Blurb and has shared his ideas which will hopefully inspire others to do something similar. There must be many ways to do this, but here is what I did. Images shown as examples have sensitive information blacked out. Firstly, I looked through my research notes and chose the family units where I had enough information to make it worth my while writing them up properly. 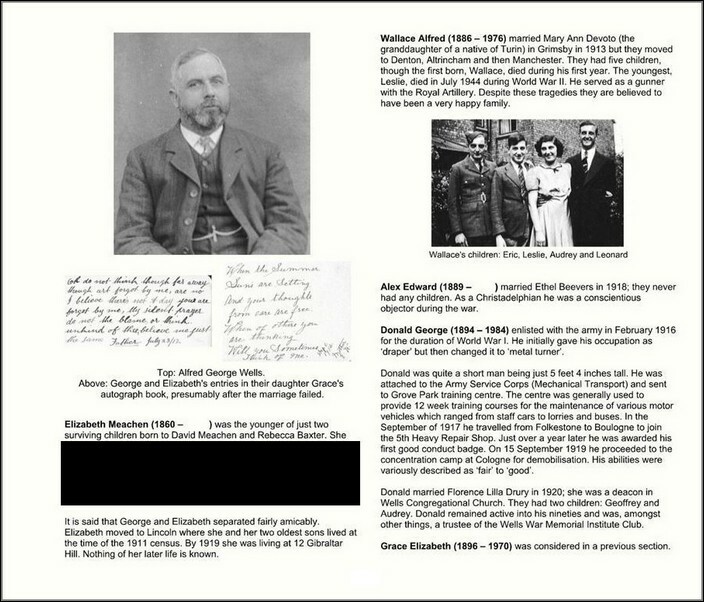 The further back I go I only have baptism, marriage and burial data with no biographical detail at all – it’s worth mentioning them but not worth giving them a section to themselves. The family units [father, mother and children…one of whom is a direct ancestor] were each given a section number. 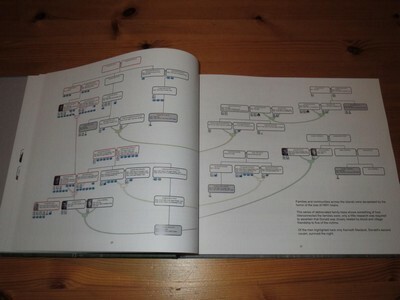 The contents pages consist of 9 family trees showing only direct ancestors. The first one shows my children up to their great-grandparents (4 generations). 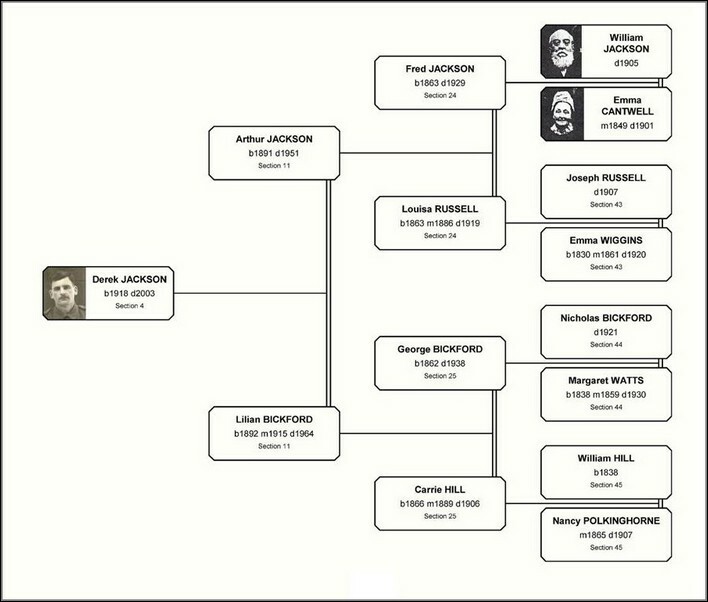 As there are eight great-grandparents, each of them then has a tree showing direct ancestors back to their great-grandparents. Each box indicates which section number to turn to read about them, their spouse and their children. 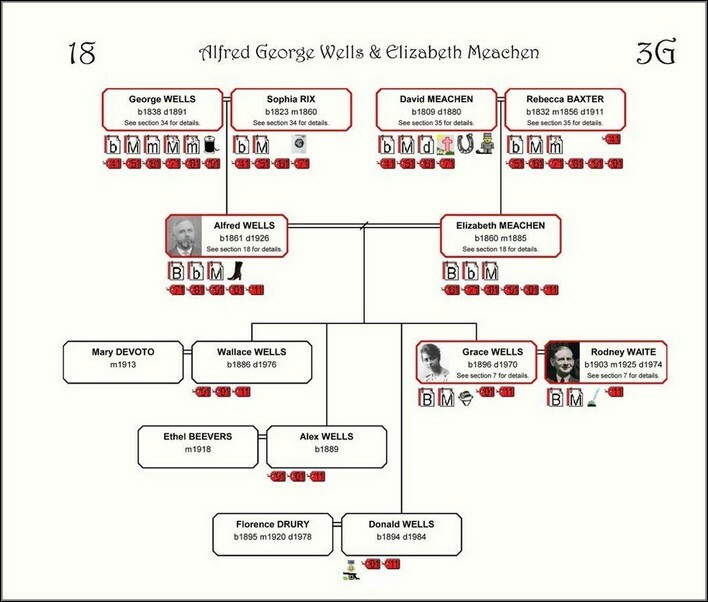 Direct ancestors are shown in red boxes. 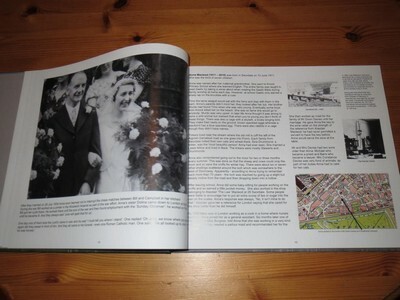 The ‘3G’ refers to the fact that the couple considered are the ggg-grandparents of my children, for whom the book was written. This section is about Alfred George Wells and Elizabeth Meachen. 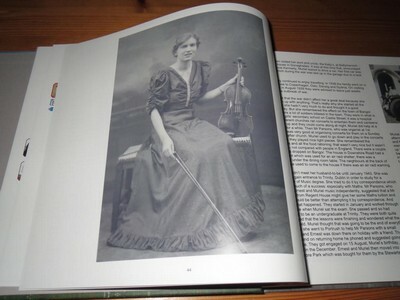 Their daughter, my great-grandmother, has already featured in section 7. Alfred’s parents can be found in section 34. Elizabeth’s parents can be found in section 35. 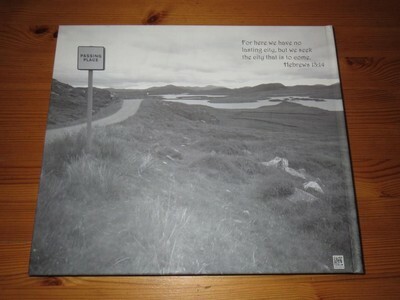 Book size chosen was 'large landscape' format, which measures 33cm x 28cm. I have used Arial font, size 12, with Harrington font for titles. 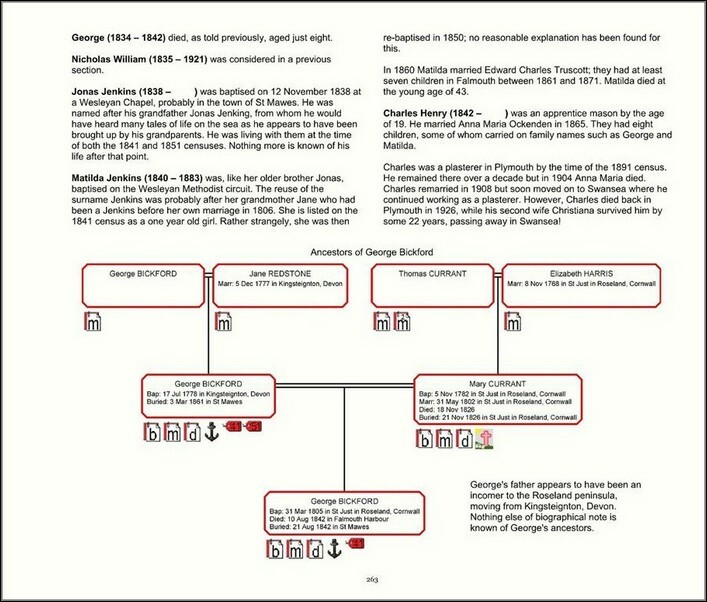 Grace Elizabeth (shown at bottom of page) is a direct ancestor, and so isn’t considered again. We’re now approaching the point where names of ancestors are known, but nothing more. 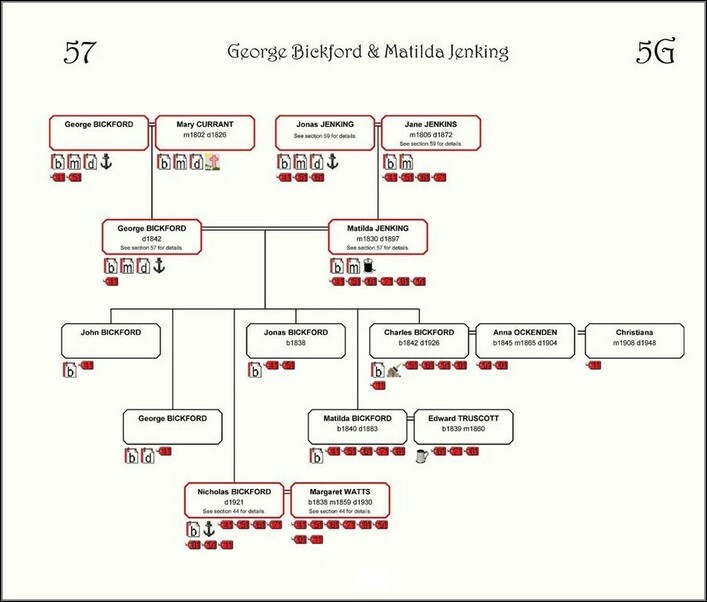 This image shows that the parents of the couple in question have different levels of information known about them. Jonas and Jane are well enough understood to warrant a section in their own right – section 59. However George and Mary are not so well understood – so no section is mentioned. Instead they and their ancestors are dealt with at the end of this section. Also included were pages for acknowledgements and an index.